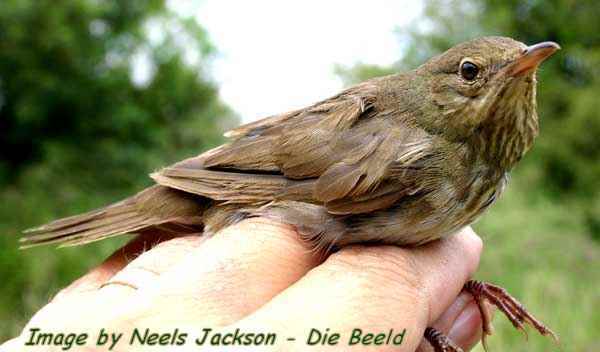 Unusual influx of River Warbler Locustella fluviatilis, in Northern South Africa, March-April 2004. 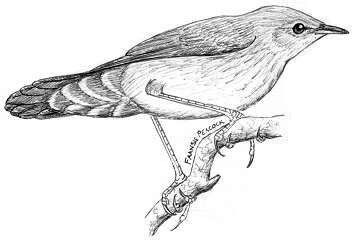 The River Warbler, Locustella fluviatilis, has generally been regarded as a rarity with less than 20 confirmed records for the Southern African Region, pre 1991. Since then the number of records have increased substantially, and Kriek (in litt. ), Herremans (1994) and others drew attention to the possibility that this species has been widely overlooked in its Southern African non-breeding range due to its extremely secretive nature, specific habitat requirements and the difficulty in recognising its calls and song. An increase in records and extent of its range has also been noted in the Palaearctic breeding range Cramp et al (1992). River Warblers are now known to occur regularly at certain localities in the Pretoria area, and several birders, under the guidance of Mostert Kriek - have been engaged in a process of monitoring this species for some years. Due to the paucity of records in South Africa, small, highly localised territories and the ease with which moulting birds are disturbed, the localities at which it has been recorded, have not been made known to the general birding community. In South Africa, River Warblers are most easily located from mid March onwards, when, on the completion of moult and in preparation for the northward migration, the species becomes vocal, particularly at dawn and dusk. In addition to the characteristic insect-like stridulation song (of what is here presumed to be males), diagnostic contact calls and alarm calls assist in locating this species (see below). Regular searches during periods of peak calling activity and in suitable habitat, between 1998 and 2004 produced only a handful of records north of Pretoria, particularly within QD squares 2528AB, 2528AA, 2528AC and 2528CB. Kriek (in litt), Peacock (unpubl data). However, during March and April 2004, an unusually high number of River Warblers were located in northern South Africa, with at least 30 birds recorded within 100km of Pretoria as well as unusual numbers further north. The Pretoria records are summarised below. Observers: RM=Richard Montinaro, EM=Etienne Marais, FP=Faansie Peacock, RV=Ronel Viljoen, SR=Selwyn Rautenbach, AM=Andre Marx, RG=Rob Geddes, PvZ=Pieter van Zyl. In the same period, birders from BirdLife Northern Gauteng found a single River Warbler near the Crocodile River near Dwaalboom (Thabazimbi) on 24 March. A visit to north-eastern Limpopo Province and Northern Kruger National Park produced 16 records (all singing males) between 26 March and 2 April. (Montinaro unpubl data). Individual birds were also recorded from Albasini Dam and Polokwane Game Reserve. At the main study site, the Warblers frequented thickets of dense Ziziphus, Grewia and Dichrostachys scrub, herbaceous growth and lush, tall grass under the canopy of taller Acacia and Combretum spp. on a clay substrate, with secluded open soil surfaces for foraging. Some of the sites were in well-vegetated lower-lying depressions on the edge of flooded grasslands, and all sites were within c.300m of the Pienaars River. Males' characteristic, rhythmic singing commenced at 05:45 - 06:10 and continued with fluctuating intensity and frequency until c. 09:00, after which only occasional bursts of song were uttered until approximately 11:00. In addition, diagnostic "pwit" or "tsit" alarm calls were given regularly, repeated singly or in a series (i.e. "tsit-tsit-tsit…") often in response to the singing of a nearby male (thus implying a territorial function) or to disturbances. Field observations showed that non-singing birds (probably females or juveniles) are often closely associated with the sites where males are observed singing, with two birds calling from as little as 1m apart in some cases. This indicates that a level of gregariousness does exist on the non-breeding grounds, contrary to the current belief that River Warblers are solitary outside the breeding season. It was also consistently found that singing males seemed to be concentrated within clusters of 3 - 4 birds in a small area (earshot), with an apparent absence in intervening areas. Singing males were often found from as little 20-25m apart, representing very high densities locally (i.e. 2 - 4 birds per ha), but the aggregation of singing males, secretive nature of the birds and inaccessible and variable habitat makes detailed population analysis complicated. Only one area (an ad-hoc segment of 3.1km on the north side of the Pienaars River) was surveyed with any degree of thoroughness and this linear sample produced a minimum of 15 birds (10 males) i.e. 1 bird / 207m. Considering the likelihood that females and silent birds were probably widely overlooked, a realistic total for this linear sample is likely to be at least 20 birds. Since the habitat is similar on both sides of the river, it might be assumed that a further 20 birds would be present on the southern side of the river, giving a total of 40 birds/3.1km or 12.9 birds per km of suitable river frontage. If this seems high, it should be noted that this sample was obtained outside of the optimal time of day, i.e. when most River Warblers have in fact stopped vocalisations! The ad-hoc samples at Vaalkop (Elands river), Buffelsdrift (upper Pienaars River) and on the Crocodile river near Thabazimibi suggest that River Warblers occurred widely in suitable habitat across the region. While we have insufficient data for a conclusive population estimate, we have calculated the probable range within which the true figure may lie. Significant portions of the lower Pienaars, the Elands, and parts of the Crocodile and Hex rivers in eastern North-west Province, offer similar riverine habitat to that at the localities where River Warblers were encountered (pers. obs.). The area we considered lies between 27º 18º E and 28º 48º E, and south of 25º S, covering about 23 000 km2 of the Limpopo Basin, mostly at altitudes below 1100 m. Excluding heavily populated areas, and areas with steep topography, the above-mentioned rivers have a river frontage of at least 271km. Assuming that the density found at our main survey site on the Pienaars River is a maximum, and that the actual mean density along these rivers lies in the range 20% - 50% of this maximum, the total number of River Warblers that were present in this area would be within the range 699 - 1747 birds. It should be noted that this excludes a consideration of suitable habitat along smaller drainages, which are very extensive in the area, and where the species has been recorded in previous years. The unusually high numbers recorded during this season is likely to be an effect of variations in weather patterns that reduce suitable habitat in parts of the traditional over-wintering grounds, while creating an abundance of suitable habitat for River Warblers in other areas. A very interesting and unexpected pattern rainfall pattern occurred during the summer season of 2003/2004, with widespread drought conditions over much of Southern Africa. It is worth noting that Central Mozambique - including the Zambezi Valley - as well as northern Botswana and parts of Zambia received much less than the average rainfall in the period September to January. Much of the region then experienced above-average rainfall from mid January to mid April, including most of Limpopo Province. This resulted in large areas developing typical habitat for over-wintering River Warblers during mid to late summer when this species arrive in Southern Africa. At our main survey locality (Pienaarsrivier) widespread flooding occurred, creating much of the favoured floodplain-edge habitat often frequented by River Warblers. A reflection of the unusually suitable conditions is the presence of several other generally uncommon species that moved into the area - examples being large numbers of Harlequin Quail and Corn Crake, good numbers of Common Whitethroat and small numbers of Thrush Nightingale and Striped Crake. In this article we have reported field observations and provided a preliminary discussion of environmental conditions and apparent trends as well as possible explanations of the phenomenon observed during the 2003/04 season. Longer-term data and more comprehensive population statistics (taking into consideration factors like fluctuations in the demography of the Palaearctic breeding population, migration routes etc.) would be needed to draw unequivocal conclusions about the population dynamics of this enigmatic species. We would like to thank a number of people for providing us with information about River Warbler sightings. In particular, we thank Richard Montinaro, Rob Geddes, Andre Marx, Selwyn Rautenbach, Rynetta Coetzee, Frans van Vuuren, Joe Grosel and Pieter van Zyl. Furthermore, we thank Mostert Kriek for providing valuable background information on this species and Marc Herremans for his comments & suggestions. Harrison J.A, Allan D G, Underhill, L.G. Herremans. Tree, A.J., Parker V and Brown, C.J (eds) 1997 The Atlas of Southern African Birds, Vol 2. BirdLife South Africa Johannesburg. Kriek JM (in litt) River Warblers in southern Africa - A list of sightings.